Once someone said to Andrew they wanted to go to an event, ‘because a bespoke poem had been written for a pop-up venue’ and Andrew wanted to punch that person in the face. Instead he wrote a poem about carpets. He questions, is there a need to fight poetry, how violent do we need to be with poetry, does poetry afflict the comfortable and comfort the afflicted or is it the reverse, and is it just too easy to go with aggression? Fighting poetry isn’t a lifelong commitment, it is bloody victory and whimpering defeat. Fighting Poetry is a symbolic narrative of three rounds of poetry combat. The performance tracks Andrew as he swings against the clichés, tropes and characters of poetry writing and performance. In the second act he is unable to escape these same concepts that drive him to poetry violence as blow after blow rains on him. A framed snapshot of his first ten years of writing, publishing and performing poetry, this is a show that delves into the perspectives, tools and objectives of poets writing and performing their work. It is both Canberra-centric in its examinations but wider-ranging in its exploration of and experiments with poetry. The play uses two key facets of satire: 1) it allows you to say almost anything and 2) it can go places that serious discussion may not. As satirical theatre founded in poetry and polemic, Fighting Poetry tackles some problems faced by satire, including preaching to the choir rather than confronting the target, that art doesn’t change other minds as much as it changes the creator’s life, that satire doesn’t work if you are obviously trying to be funny, and that satire should be full of teeth. Fighting Poetry was developed by Andrew Galan for You Are Here 2017. Its development was assisted by funding from the festival. The text and performance of Fighting Poetry received invaluable dramaturgy from Canberra theatre practitioner Nick Delatovic. The play was staged on 6 April 2017 as part of the festival. 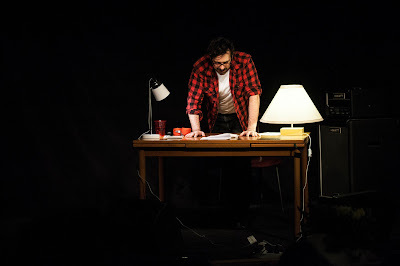 The play makes use of Andrew’s poetry previously published in Australian and international poetry journals as well as his first two books, That Place of Infested Roads (Knives Forks and Spoons Press) and For All The Veronicas (Bareknuckle Books). New poems written for the play during the development of the work over six months were also included. The key objectives of the work was to create theatre that makes people think about the use of poetry and that prompts them to buy poetry books. Movement and positioning during the play was devised while working with Nick Delatovic to strengthen and extend the performers range of action, as well as to ensure that these actions were deliberate and symbolic. This was done over four months and facilitated the exploration of positioning to show key concepts and assist the audience in absorbing the play. The composition of the text was designed to integrate the scripted monologues with already written and new poems in a way that formed a coherent theatre piece. The intent was to use the poetry seamlessly. This process involved re-scripting with advice from Nick, as well feedback from two rehearsal reads with invited audiences. Scripting and staging the play involved careful consideration to ensure that the satire targeted the tropes of poetry and that the invective served the key polemics of the work rather than engaging in needless ad‑hominem attacks. Thank you for writing this, Andrew. It gave me further insight into the play and it helps me better understand what goes in your creative process. oh, and thank you for the quote - I did not expect that.